A Japanese scientist involved in a scandal over discredited stem cell research has been found dead at his laboratory in an apparent suicide. Prof Yoshiki Sasai, 52, was cleared of direct misconduct by an investigation, but faced criticism for his oversight. Scientists around the world have expressed regret at losing a renowned researcher and concern at the "witch-hunt" that followed the revelations. 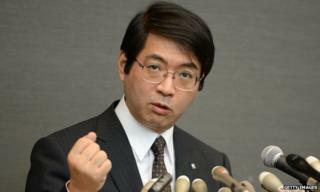 The president of RIKEN, where he worked, said Sasai was "irreplaceable". The 52-year-old professor, well known for his work turning stem cells into other types of cells like eye and brain tissue, was found by a security guard at RIKEN's Centre for Developmental Biology in Kobe, western Japan. Prof Sasai, the centre's deputy chief, was widely respected in the scientific community. But earlier this year two studies that he supervised caused controversy, after other scientists failed to replicate the results. The two papers, both published in the journal, Nature in January 2014, had suggested that stem cells could be produced from normal adult cells by dipping them into acid for a 30-minute shock period. These "STAP" cells (stimulus-triggered acquisition of pluripotency) held great promise for both developmental biology and medical science. But the widely reported findings were too good to be true, attracting scepticism and, eventually, claims of scientific fraud. The work was investigated by RIKEN and retracted by Nature in July, amid concern that some of the results had been fabricated. Although the study's first author, Dr Haruko Obokata, was found guilty of misconduct, Prof Sasai was cleared of direct involvement. He was criticised, however, for his supervision of Dr Obokata and for not spotting inconsistencies in the publications. Prof Sasai had said he was "deeply ashamed" of the problems in the papers and regretful of his role in the scandal. Many of his scientific colleagues have expressed their regret, and called for more reasonable discussion of irregular results. Others have noted the damaging effect of the fierce competition that pervades science, heaping pressure on both junior and senior researchers. Prof Robin Lovell-Badge, a stem cell researcher from the National Institute for Medical Research, described Prof Sasai as "an excellent scientist who made some fundamental discoveries", adding that he had played a central role in establishing the world class reputation of the RIKEN institute. "We will never know quite how he got ensnared into the whole story about STAP stem cells, and for some reason wasn't his usual cautious self," Prof Lovell-Badge told the BBC. "Maybe some lessons can come from this - that you have to be a little bit more proportionate in the way these things are dealt with." Nature's editor-in-chief, Dr Phil Campbell, said: "This is a true tragedy for science and an immense loss to the research community." Included in the legacy Sasai leaves behind is a clinical trial underway in Kobe, which draws on some of his work. It is testing the safety of a stem-cell based treatment for macular degeneration, a severe eye disease.